The next morning Theo wakes up to discover his wife is missing. Under police suspicion and frantic at her disappearance, he obsessively searches the streets of the Old City. Meanwhile, Kay has been transformed into a puppet, and is now a prisoner of the back room of the Quatre Mains, trapped with an odd assemblage of puppets from all over the world who can only come alive between the hours of midnight and dawn. The only way she can return to the human world is if Theo can find her and recognize her in her new form. So begins the dual odyssey of Keith Donohue’s The Motion of Puppets: of a husband determined to find his wife, and of a woman trapped in a magical world where her life is not her own. She fell in love with a puppet. 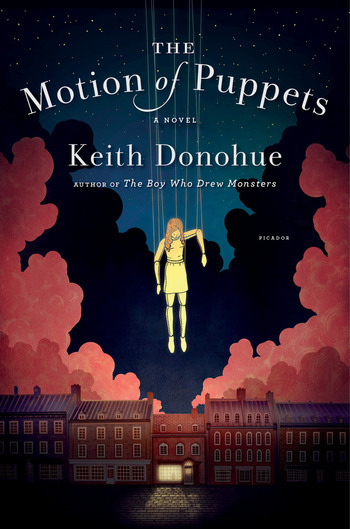 KEITH DONOHUE is an American novelist, the author of the national bestseller The Stolen Child, Angels of Destruction, Centuries of June, and The Boy Who Drew Monsters. He also writes reviews for The Washington Post. Donohue has a PhD in English with a specialization in modern Irish literature and wrote the introduction to Flann O’Brien: The Complete Novels. He lives in Maryland.